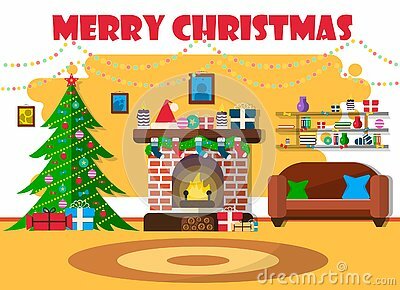 Vector illustration for Christmas with Christmas tree and retro furniture. Flat design with spruce and fireplace, decorations, Santa Claus with a bag of gifts. Vector background genetics network in cute color. Men avatar icons. Vector illustration of men characters.